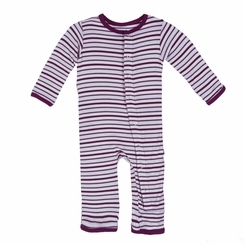 Snap your little peanut into the snuggly cuddly goodness of Kickee Pants adorable Coverall. There is just nothing better than the soft comfort your little one feels in this wardrobe favorite! Changes are a breeze thanks to our swell back flap that snaps open for easy diaper access.